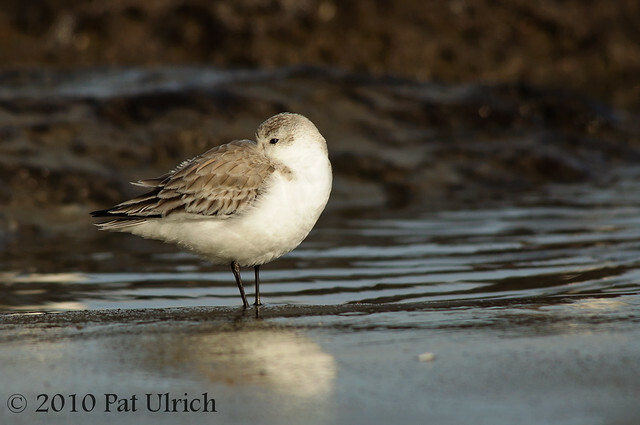 A sanderling rests in the wet sand between the rocks of Drake's Beach in Point Reyes National Seashore. I always love to see shorebirds roosting like this, with their bill tucked away. It's such a pleasing shape to my eye. View more images of these adorable shorebirds in my Sandpipers Gallery. I don't think I shall ever grow tired of looking at your shorebird photos. Nice capture as always. Blue Skies. Greetings from The Old Geezer in Southern California. I am your newest follower. Pop over and visit my blog when you have the time.